Measurement: 6.2 to 3.5 mm wide. Available also in 14K Gold. Available sizes 7 to 13 with half size increments. It is handcrafted in Dublin and hallmarked in the Assay Office located in Dublin Castle. 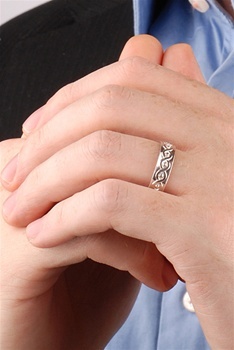 Very nice ring well made and detailed. This is the third item I have purchased they provide fast shipping and good customer service.